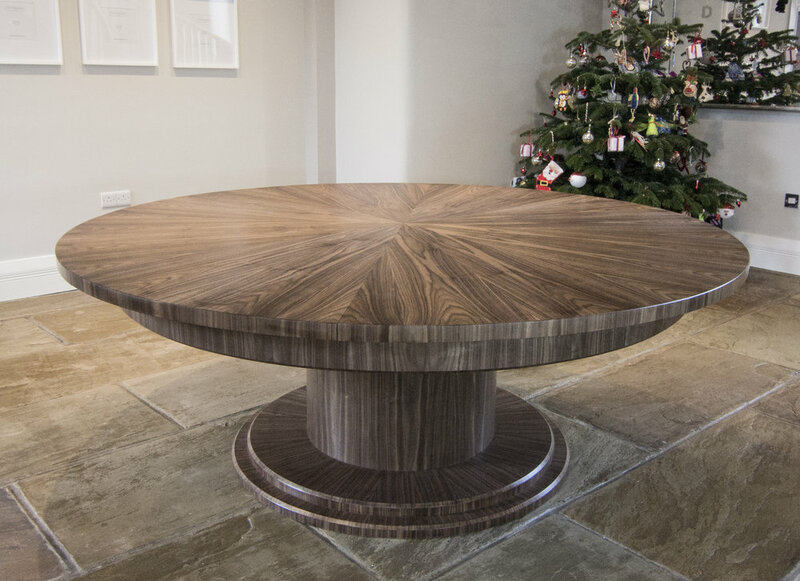 Inspired by the work of Robert Jupe, who made the first expanding circular dining tables in the 1830's, George has created a table where the expansion leaves are stored within the body of the table, and rise up automatically as it rotates. His unique unfolding star shape allows for a compact mechanism with a large range of table sizes. Some examples of the tables are shown below, please click for further pictures and videos of the tables in operation. 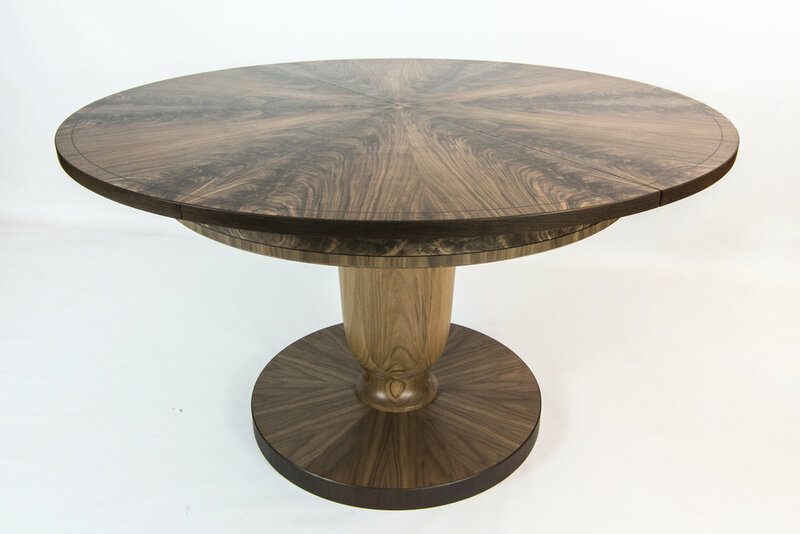 One of the unique aspects of George’s tables is how the grain is continuous in both the normal and extended states of the table. 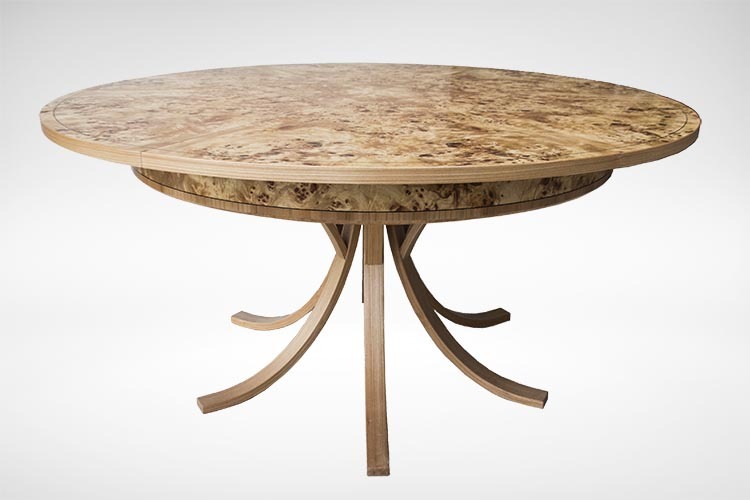 The top of the table is made from either 12 or 24 pieces of veneer. These are cut into a wedge shape and arranged in a circle to form what is known as a starburst veneer formation. Turning over alternate leaves creates beautiful symmetrical effects. 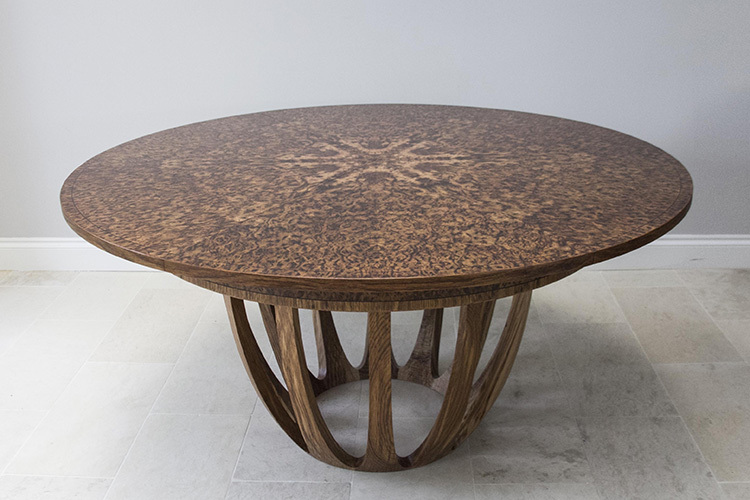 The table top shown above is made from walnut curl. 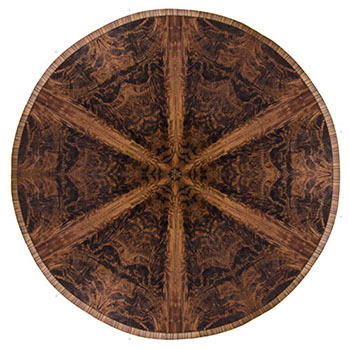 This veneer is cut from where the tree trunk divides into two, creating beautiful swirling grain patterns. If you are unsure about which timber to choose, then George can provide samples, and examples of finishes. Below you can see an example of a table top made from pippy oak. Pippy oak occurs when an oak tree sprouts clusters of small branches from the trunk. When the tree is cut open, these show as areas of burr. For this table 24 leaves of veneer were used. The red triangle shows the shape that was cut from the original leaves of veneer, and how they translated into the finished table top. 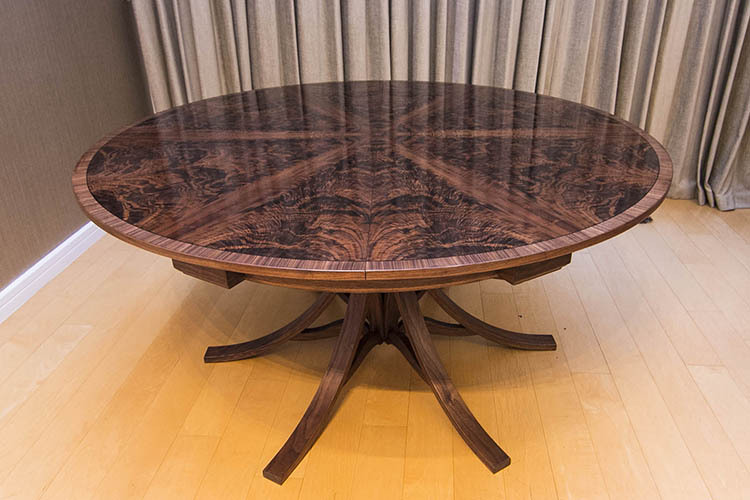 As you can imagine, moving the triangle only slightly will produce a huge number of possible tables from one section of veneer; as such each table will be special and unique. When designing the tables George draws them using CAD down to the finest detail. 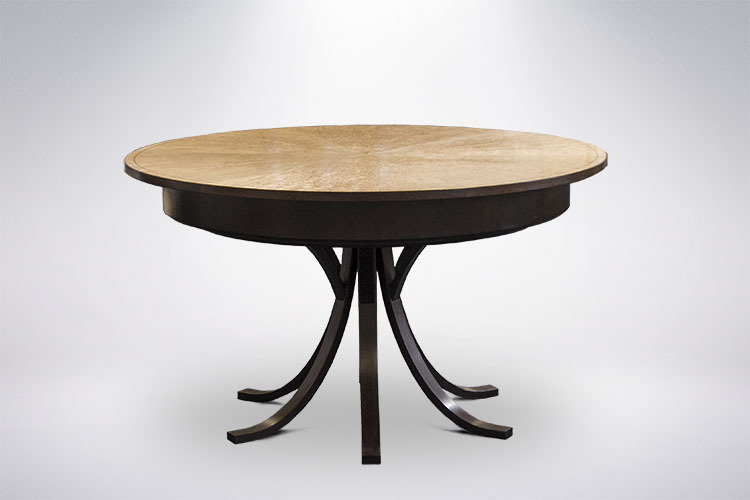 This means the diameter can be varied to suit the size of the room, or to accommodate a specific number of chairs. If a new design is being produced, then computer images such as the example above are presented to the client. These can include accurate representations of how the grain will look on the finished table. The expansion mechanism has been custom designed by George, and is formed from laser cut steel and 3D printed parts. The video below shows some of the internal workings of the table. Each table is made to order, so the size can be changed to suit your needs. However George has three standard sizes for the table. Table sizes, dimenions in mm. You can download all of this information in a pdf format from the following link. George also makes fixed size dining tables! Some examples here include a table made from solid Yew, and a space saving table with benches that push completely underneath, a table with a cantilevered steel leg, and some traditional kitchen style tables.